The Day I Was Crucified by Gene Edwards is a powerful retelling of the crucifixion of Jesus by Jesus. Focusing on the beautiful display of Jesus’ power to lay down his life willingly, obediently and lovingly; it will open the gospel in a way that only Gene Edwards can do. Especially during the time of Lent, this book is a fantastic way to not only share the gospel message but to create meaningful discussion. 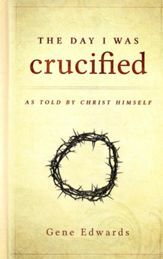 It is a tender description of the last moments of Jesus’ life upon the cross and his resurrection thereafter. The Day I Was Crucified will reveal the beautiful gift of salvation all over again. I received this book from the Book Club Network and Destiny Imagine Publishers in exchange for my honest review which I’ve provided here.